Who Wants to Take a Ride on Romney Campaign Plane ‘Hair Force One’? I just want to tell you both good luck. We’re all counting on you. 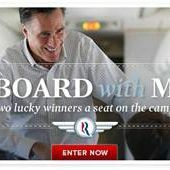 Photo: Romney Victory, Inc.
Mitt Romney’s campaign is holding a contest that will award two winners a day aboard “Hair Force One” with Mitt. 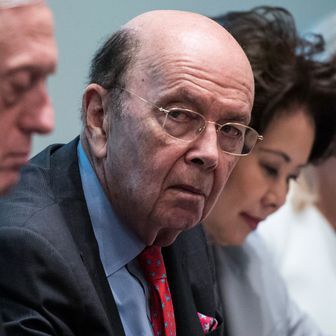 That’s Ann’s playful name for the jet, a nod to her husband’s impeccably kept ‘do. “Personally, I don’t quite know what to call it,” Mitt wrote in an e-mail to supporters. Just the “plane” will suffice. Anyhow, here’s how Romney described what the winners can expect: “I don’t know exactly what our itinerary will be, but if you’re one of the winners — I can tell you it will be exciting.” Shots from mini-liquor bottles and flip-cup? Wheelbarrow races down the aisle?! Although the entry page asks for a minimum $15 contribution, people can enter the contest without actually making a donation. Worth a shot for a student on a budget who wants to check out a few swing states.